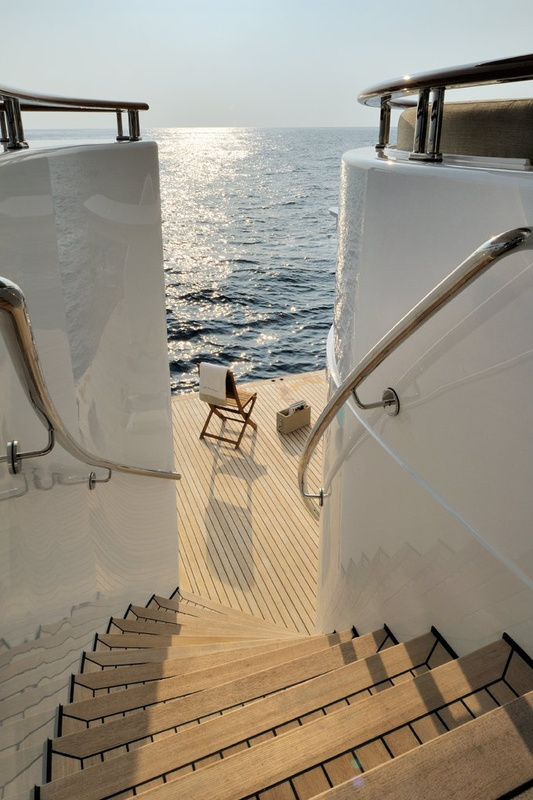 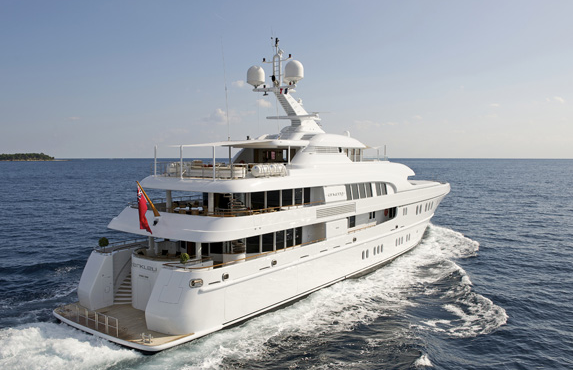 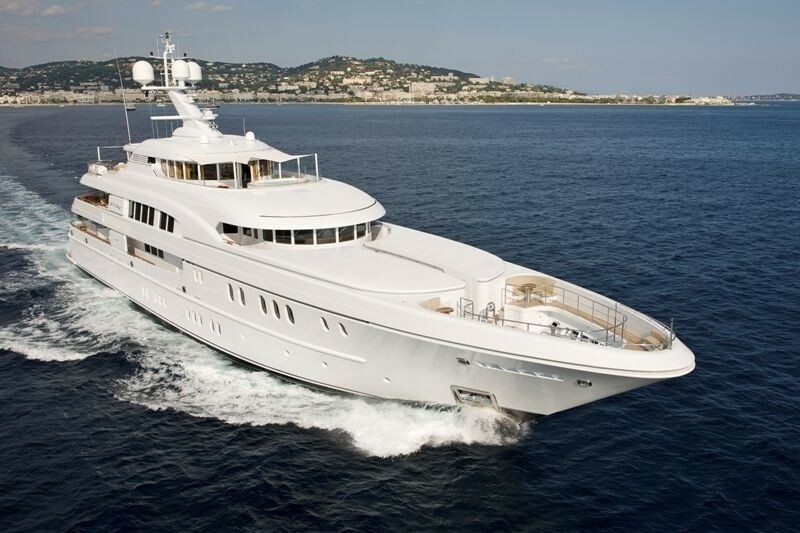 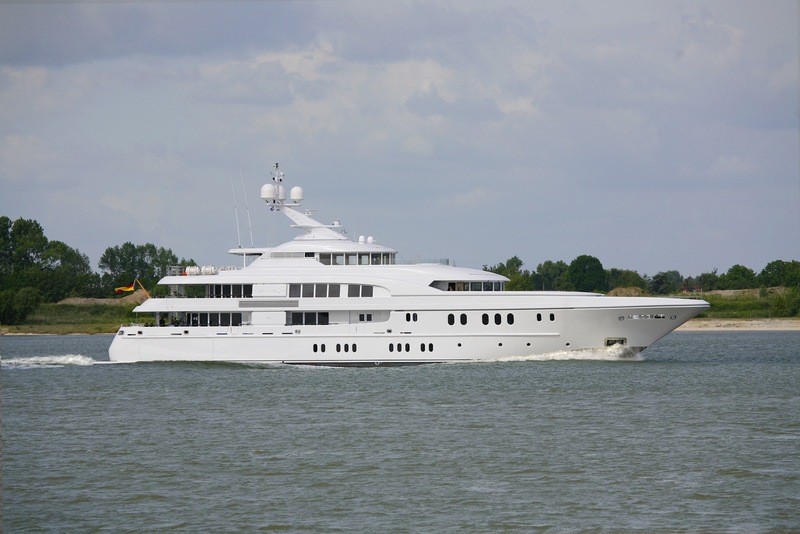 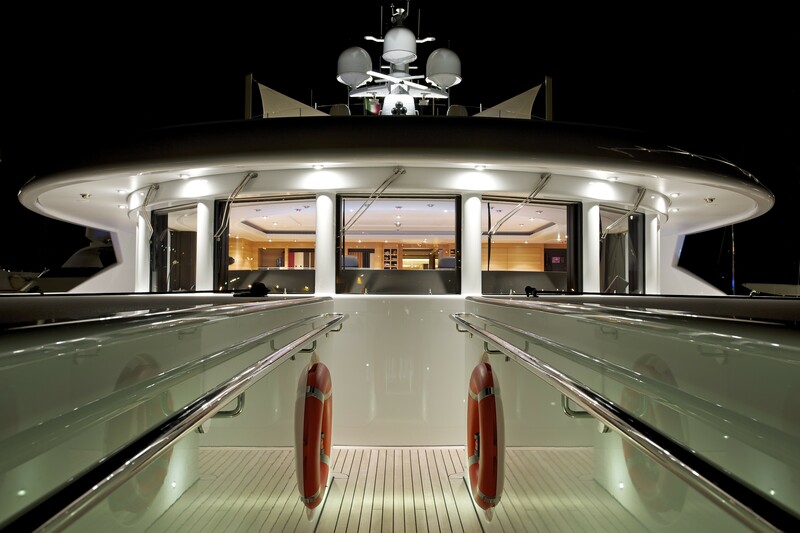 Boasting an exterior design by Espen Øino and the interior by Mark Berryman, motor yacht CAIPIRINHA (then called Arkley) has been nominated for the 'World Superyacht Awards. 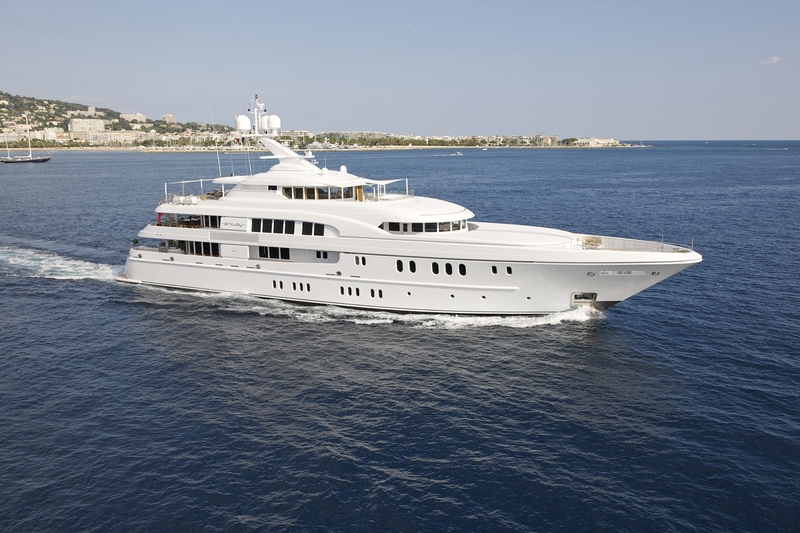 The 60m luxury yacht CAIPIRINHA is an embodiment of the philosophy that Lurssen have been carrying for years. 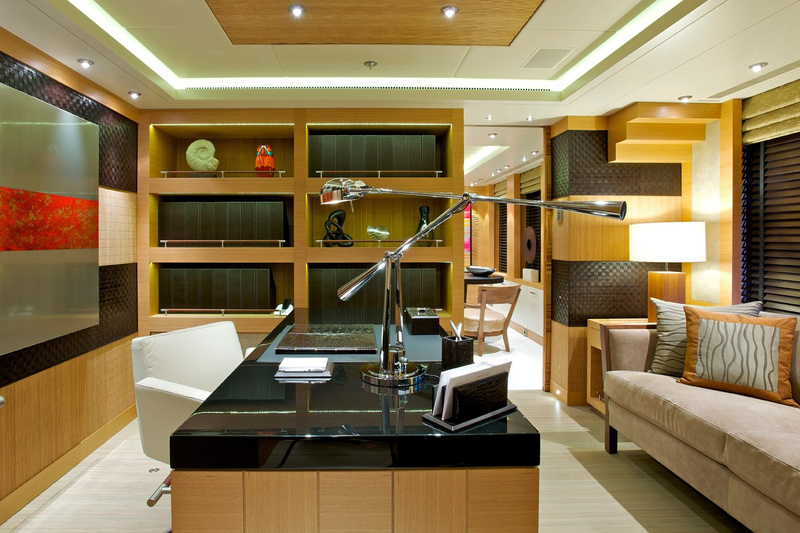 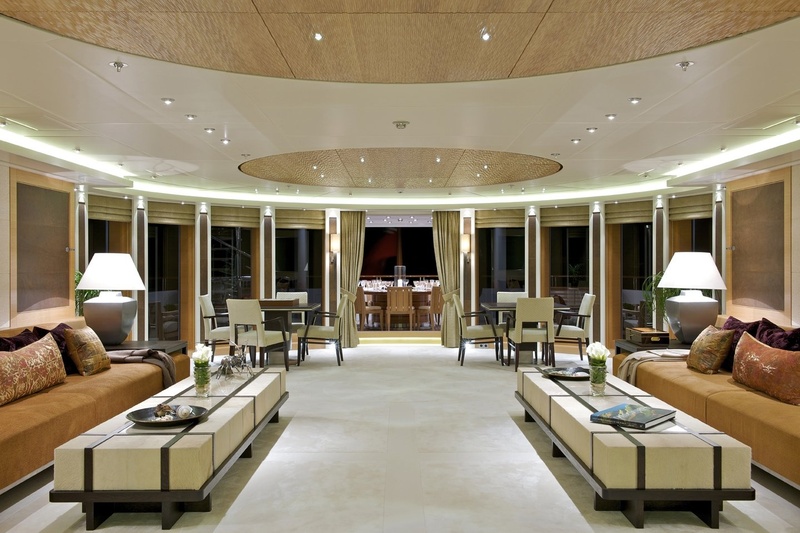 This luxury motor yacht is standing as a testament to the continuation of proven technology and design. 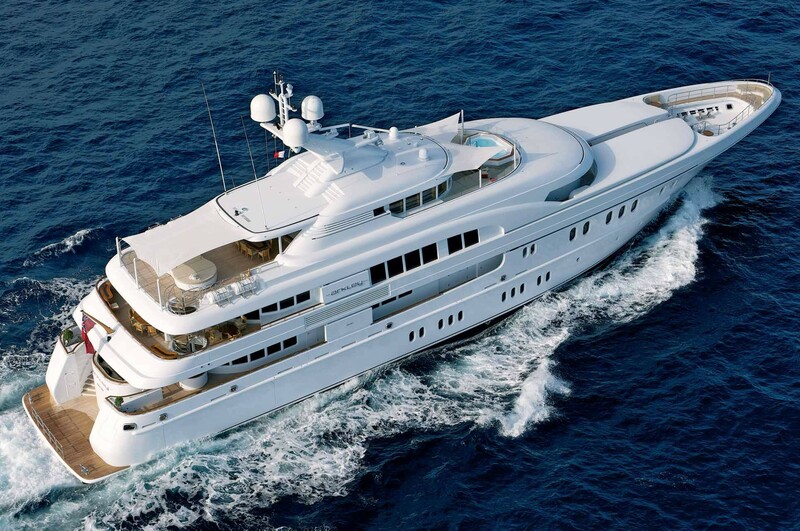 She is one of the finest yachts in the world. 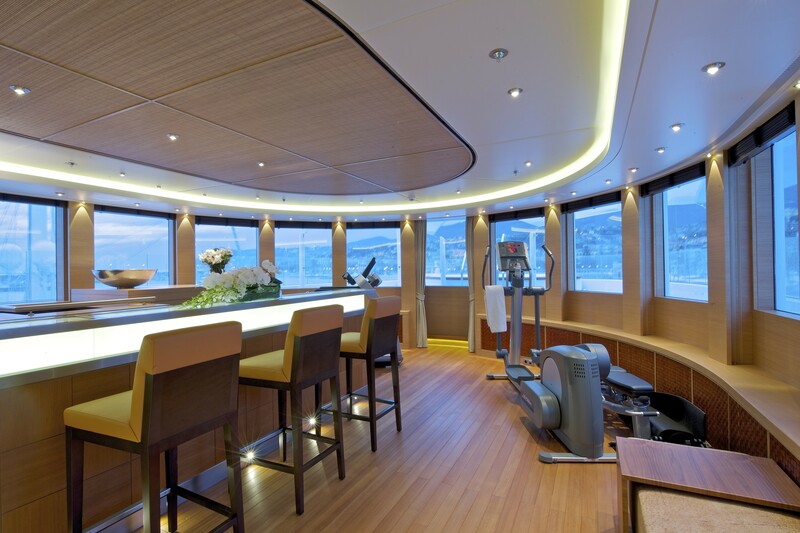 CAIPIRINHA is the ultimate luxury yacht charter having a range of amenities and equipment on board. 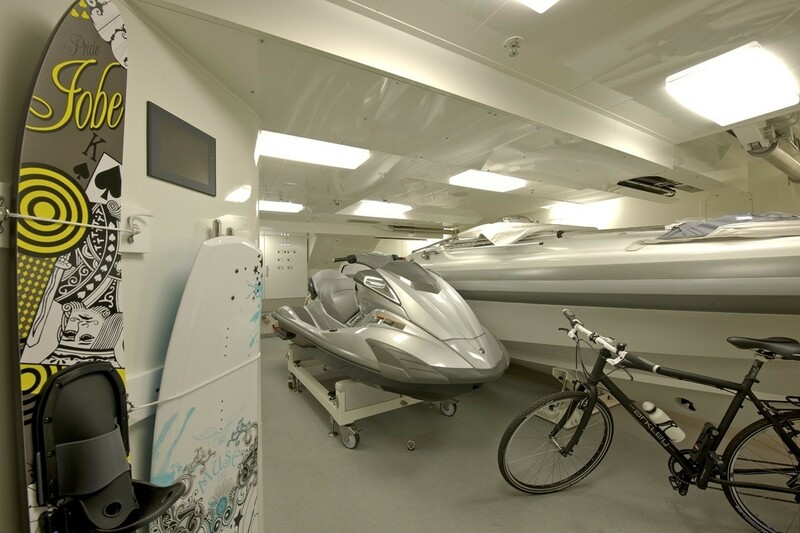 The yacht features a huge selection of diving equipment and water toys, including two luxury 7.5 metre tenders, two high performance jet skis, two SeaBob water scooters and a Laser Sailing Boat. 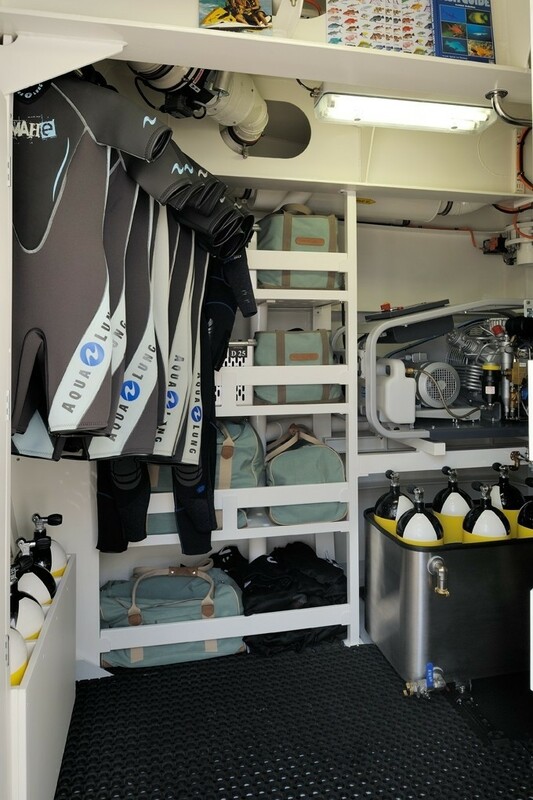 Two diving instructors are a part of Arkley's PADI certified diving school on board. 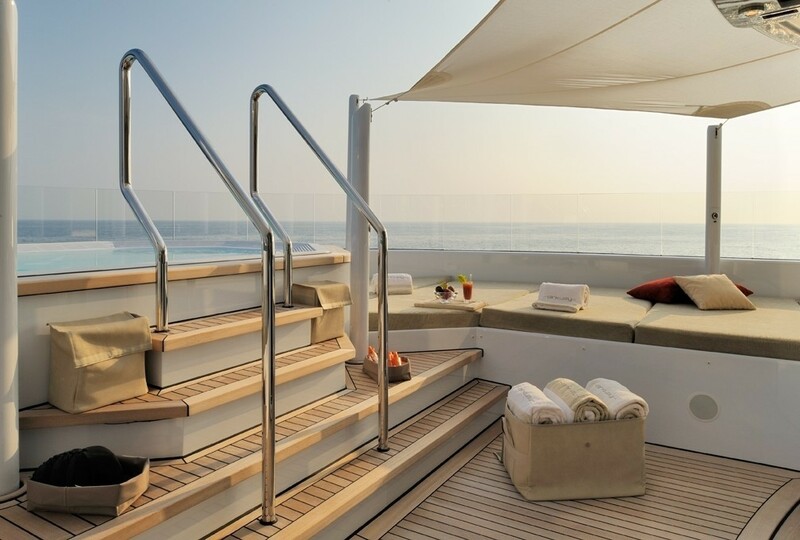 The sun-bed converts into a stage and there is a professional karaoke equipment. 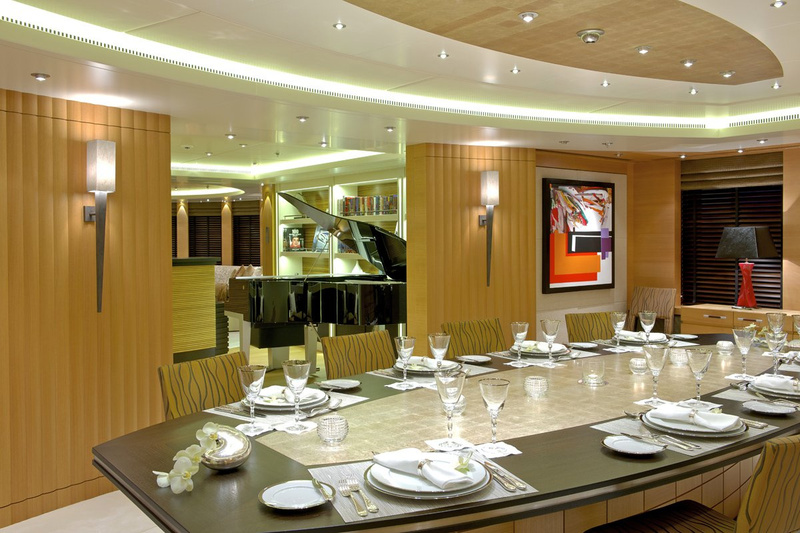 Arkley also prides herself with a dedicated and very talented chef, who will provide you with exceptional dining experience throughout your voyage. 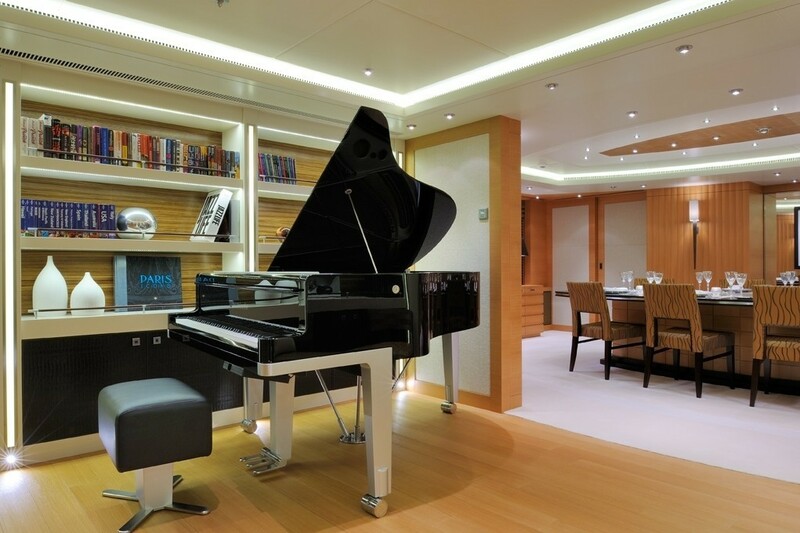 A large drop down cinema screen, a very well stocked library and for those who are passionate about music, a Porsche designed baby grand piano, are all incorporated in the main deck saloon for your unlimited entertainment. 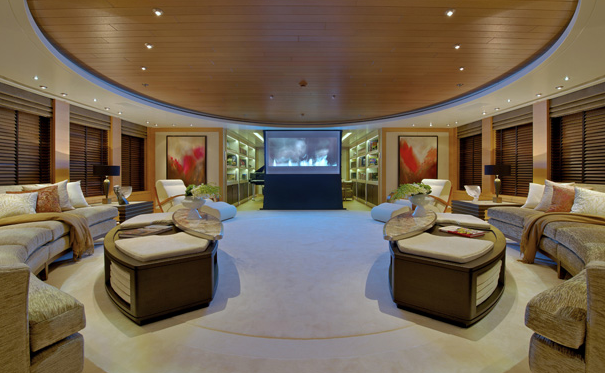 Curved sofas and coffee tables doubling up as ottomans, are perfect for after-dinner relaxation and cinema viewing comfort. 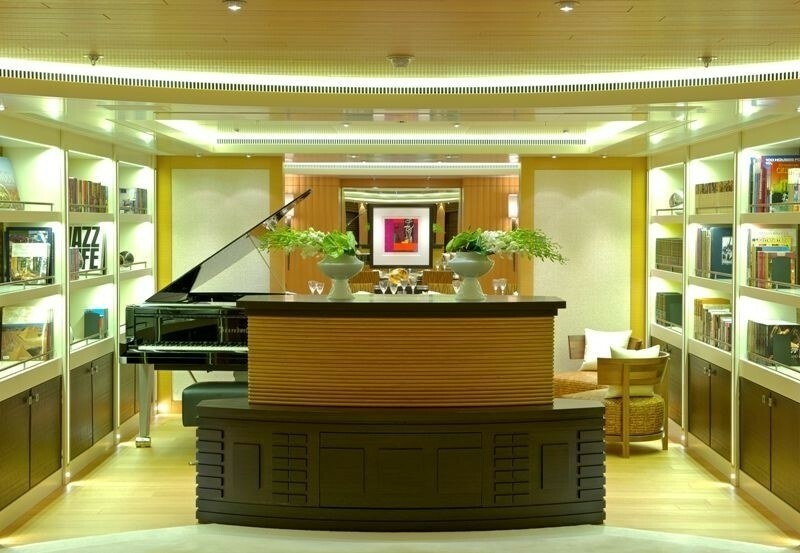 You can enjoy the magnificent view through the full-height aft windows, while listening to the piano tunes. 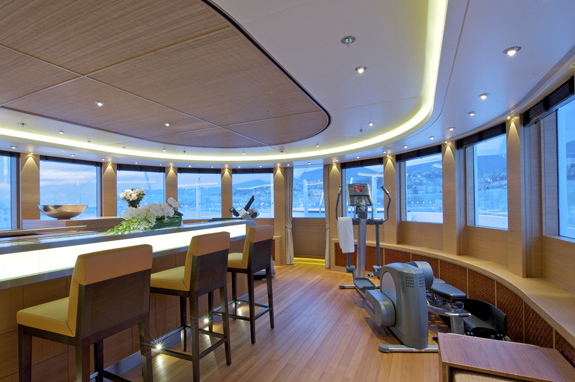 Upper deck saloon is an engaging open plan spacious lounge and bar area fitted out with game tables and two 61-inch HD flat screen TV's. 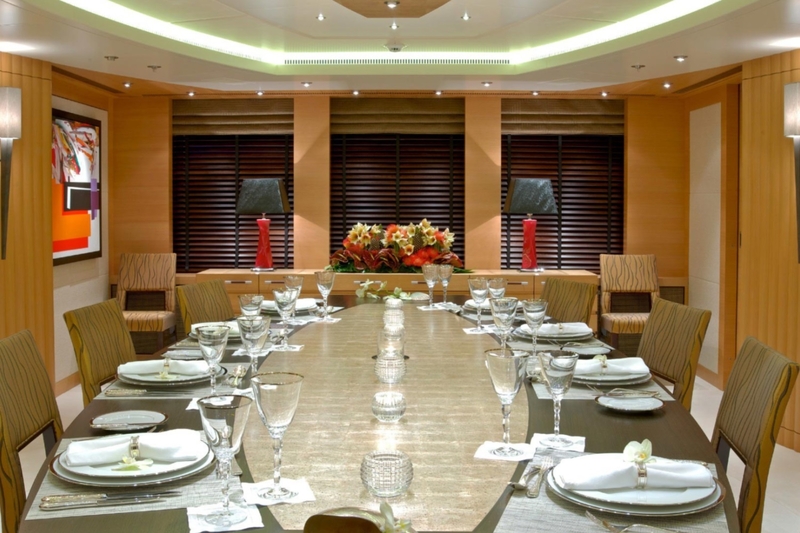 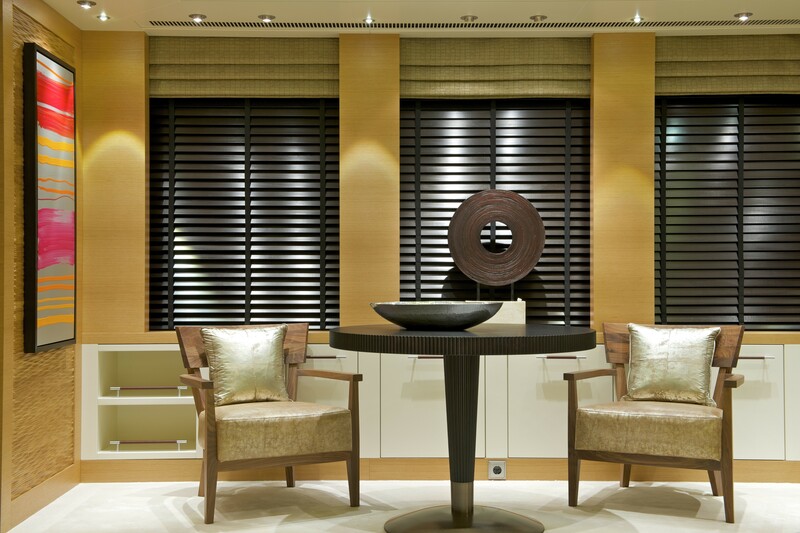 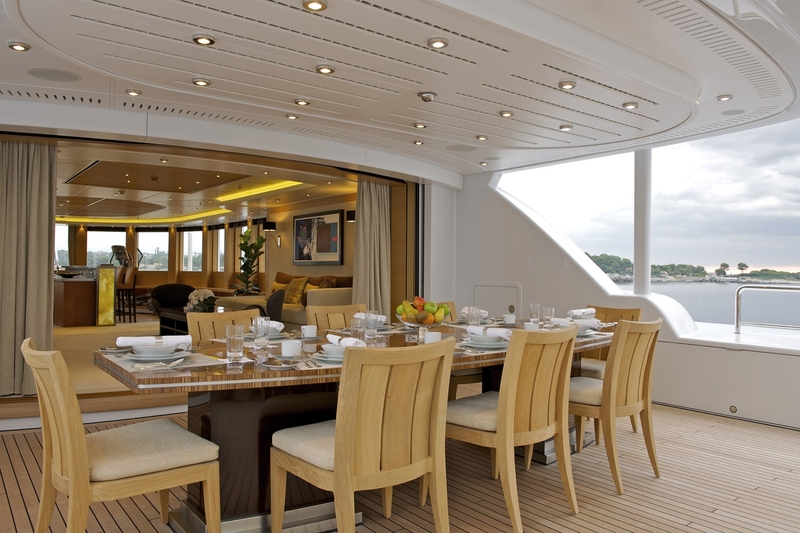 The stunning custom made exterior dining table which seats twelve incorporates a central revolving section further aft. 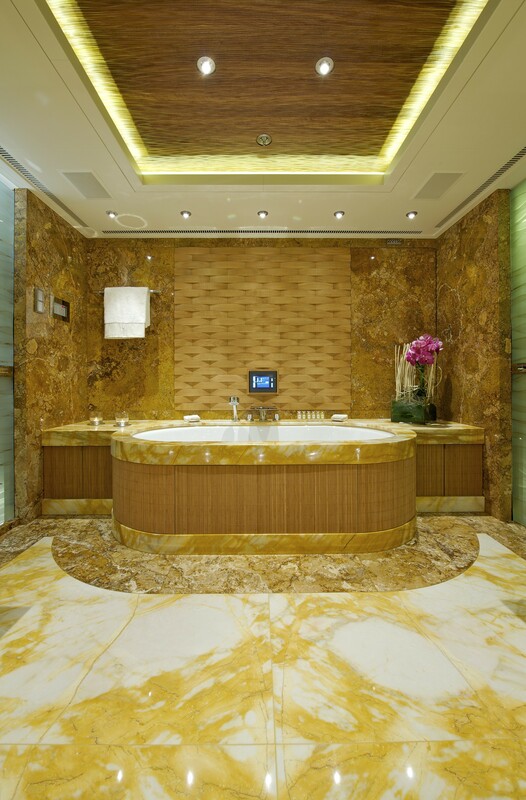 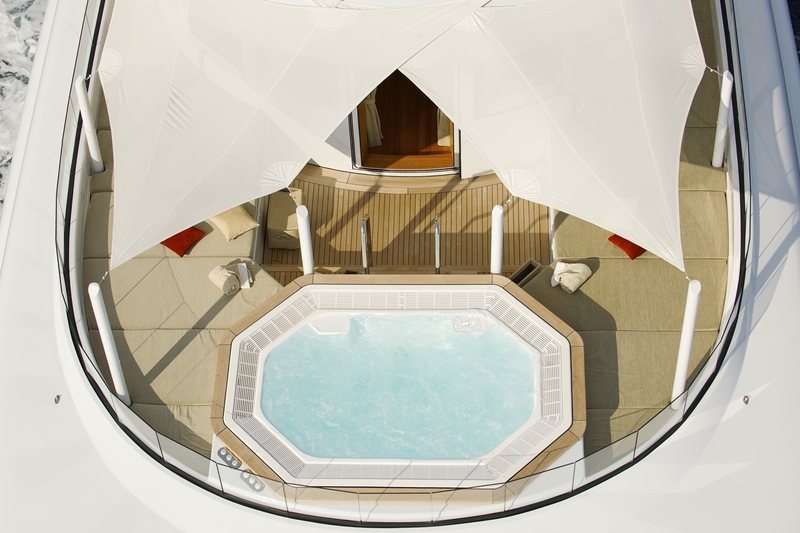 To unwind the Sun Deck saloon offers a Spa Pool, gym, bar and a casual lounge area with uninterrupted panoramic views. 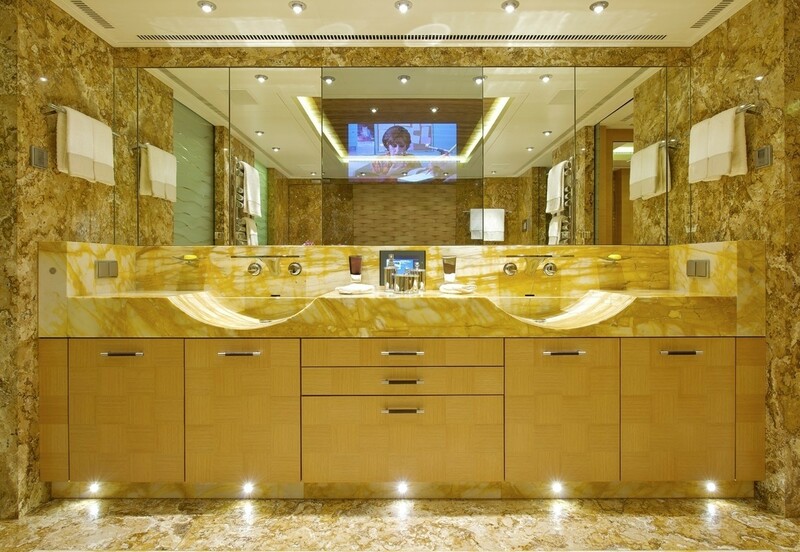 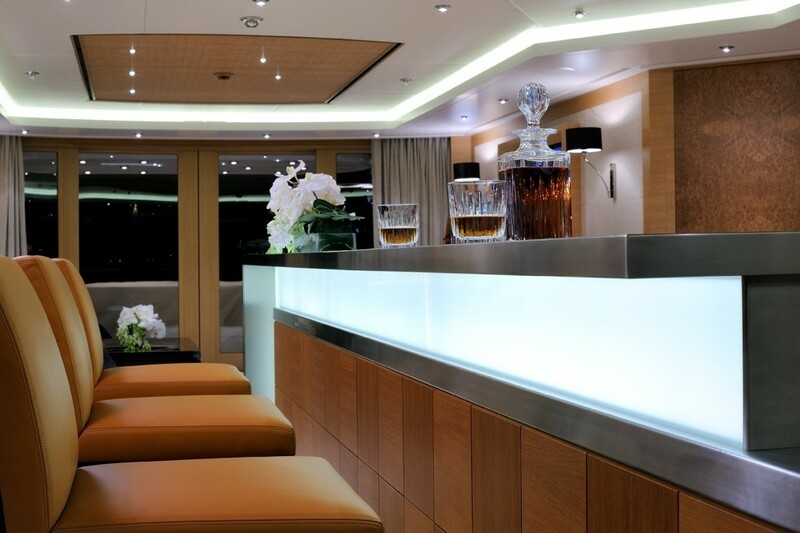 An onyx bar top completes the impressively fitted bar area. 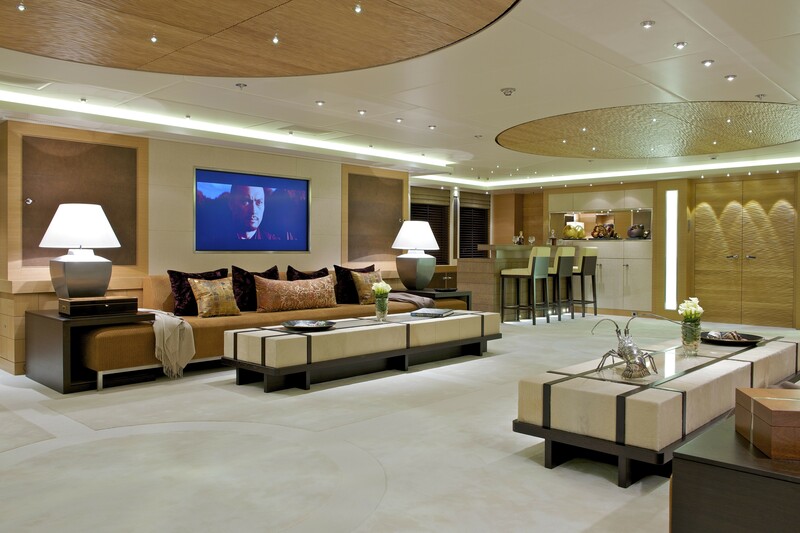 Aft of this, an informal lounge area incorporates a wide screen TV, as well as the al fresco dining area facing a small stage for evening entertainment. 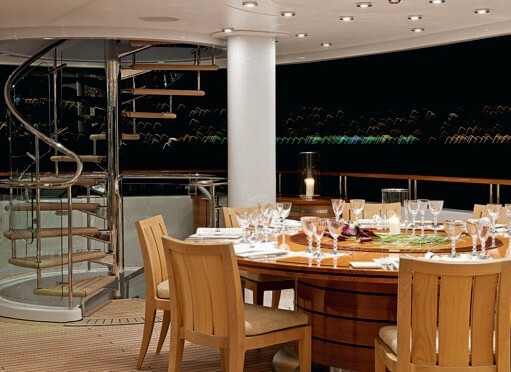 Opening of the main lounge a full-beam dining area seating fourteen, incorporates a stunning fumed oak and silver leaf table. 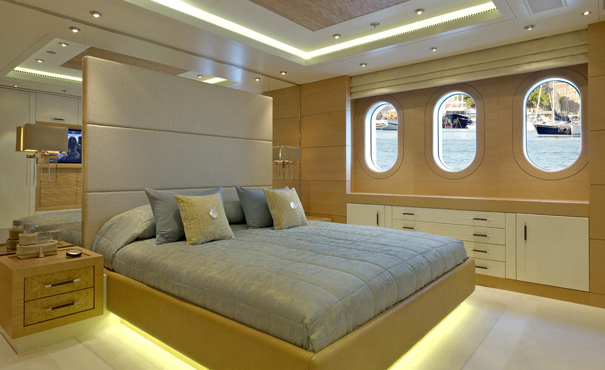 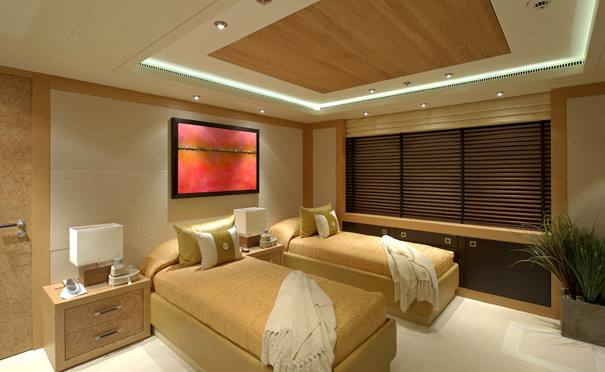 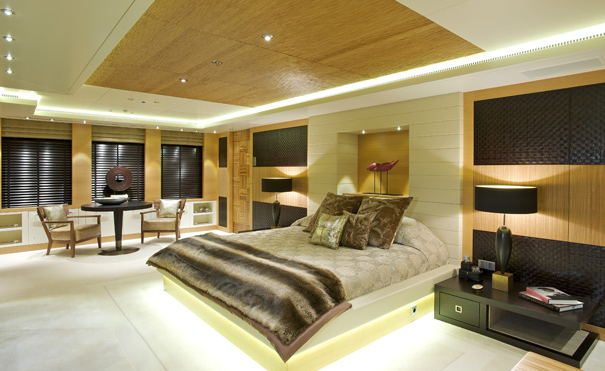 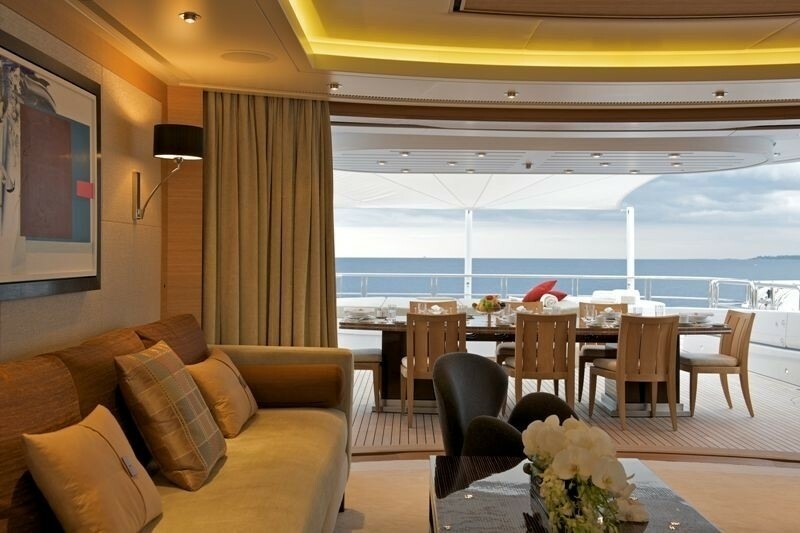 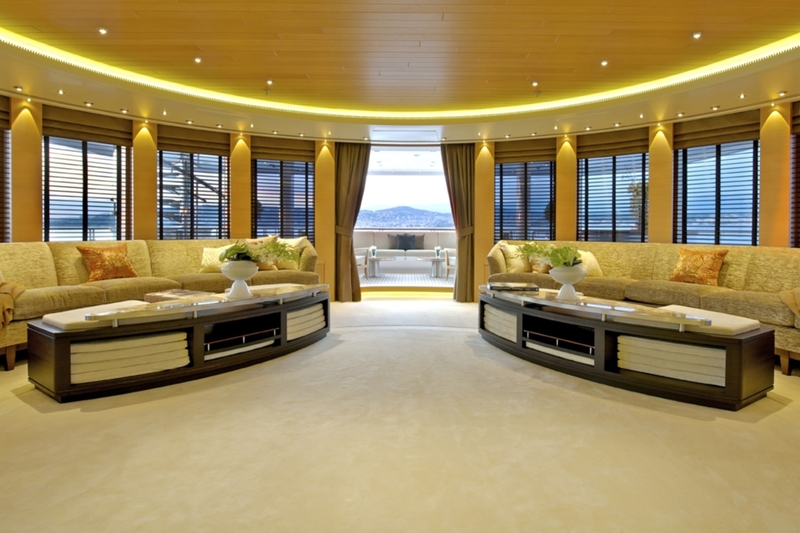 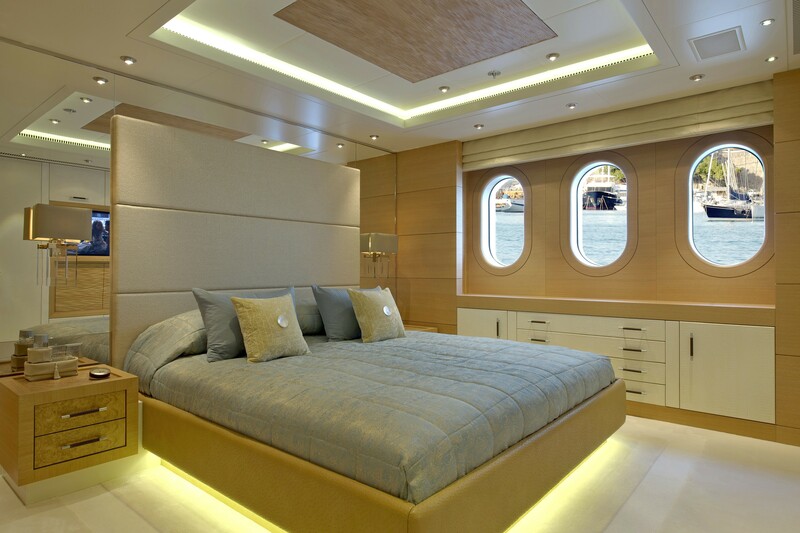 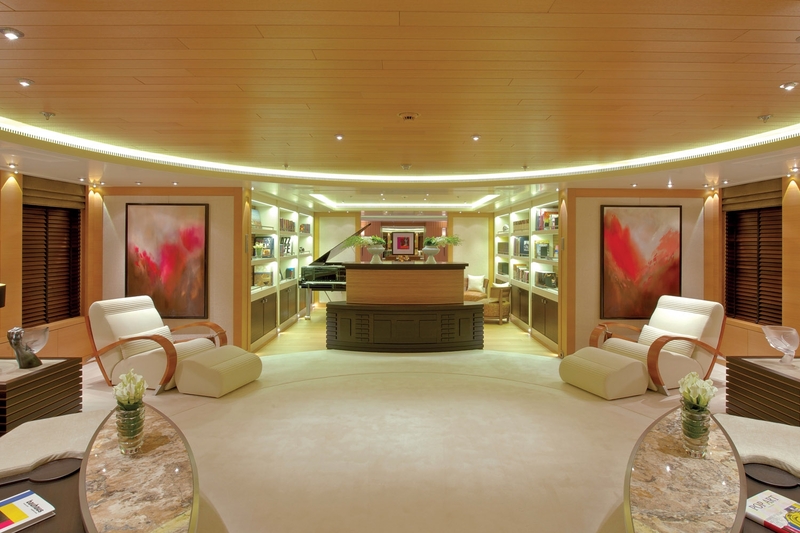 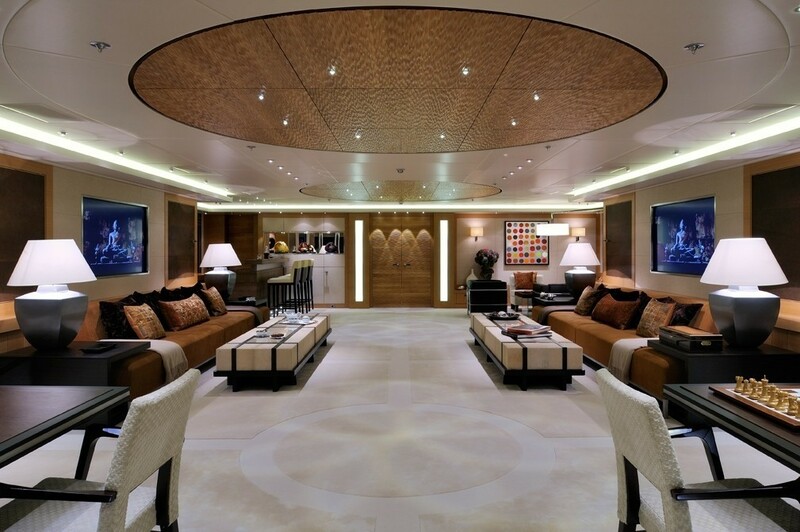 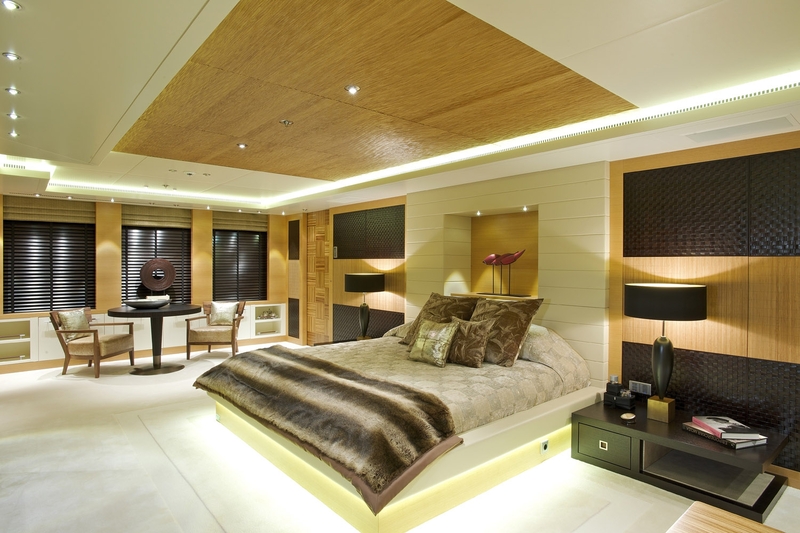 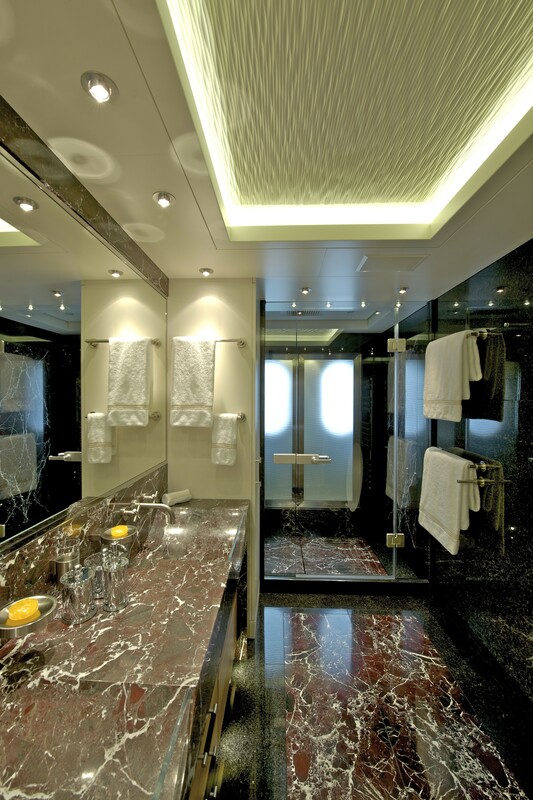 Forward of the main deck saloon is the sumptuous full-beam owner's suite. 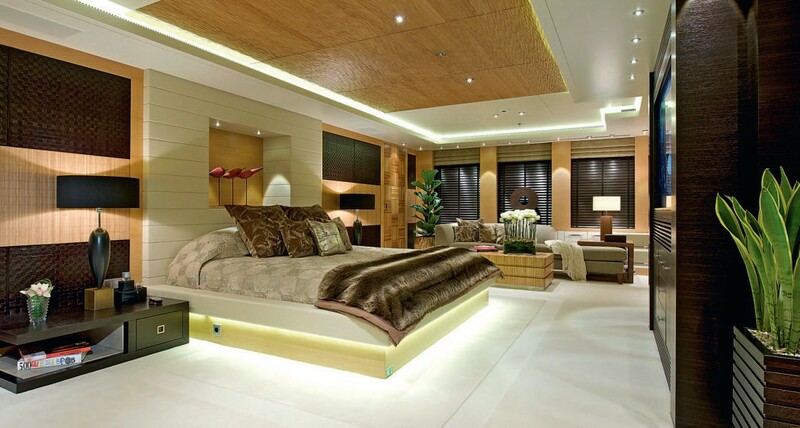 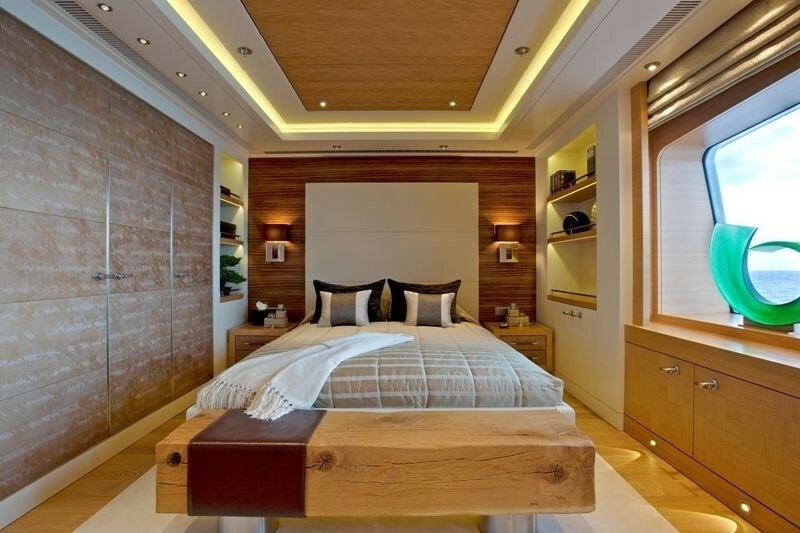 The bedroom incorporates a super king sized bed with "his and her's" walk-in dressing room. 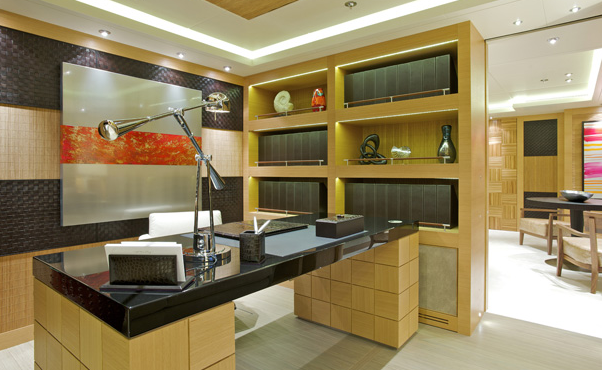 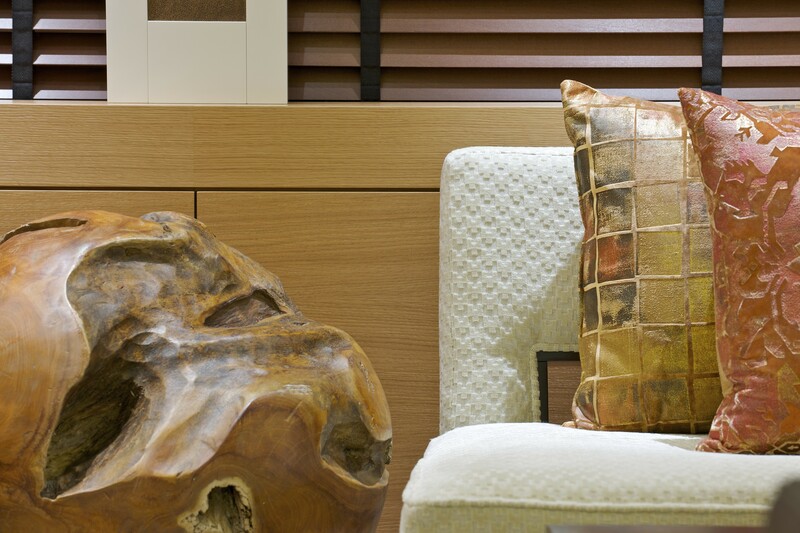 The breathtaking owner's apartment is accessible through the Owner's study. 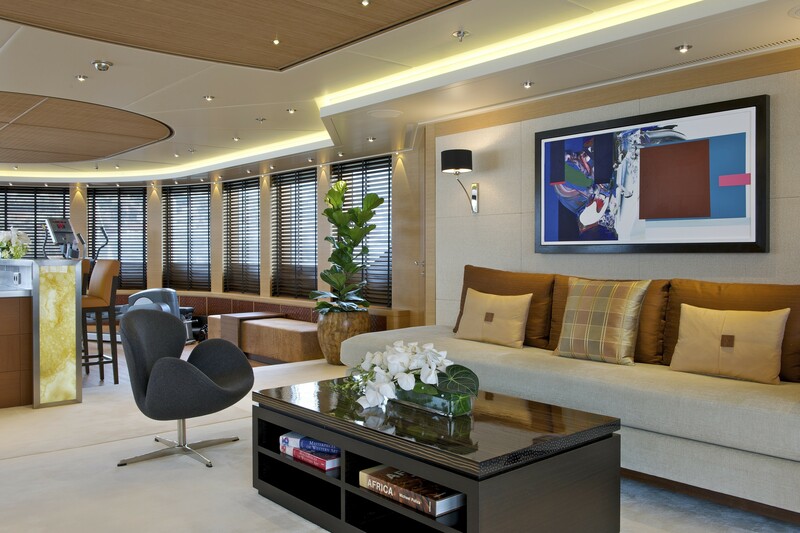 Furthermore it features a comfortable seating area and occasional dining table. 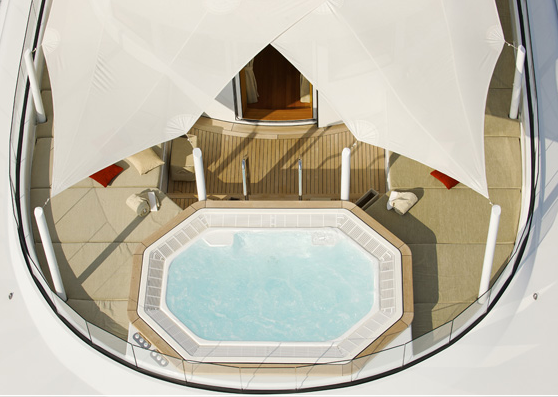 There are four luxuriously appointed double suites on the lower deck, two of which convert into twins for ultimate comfort. 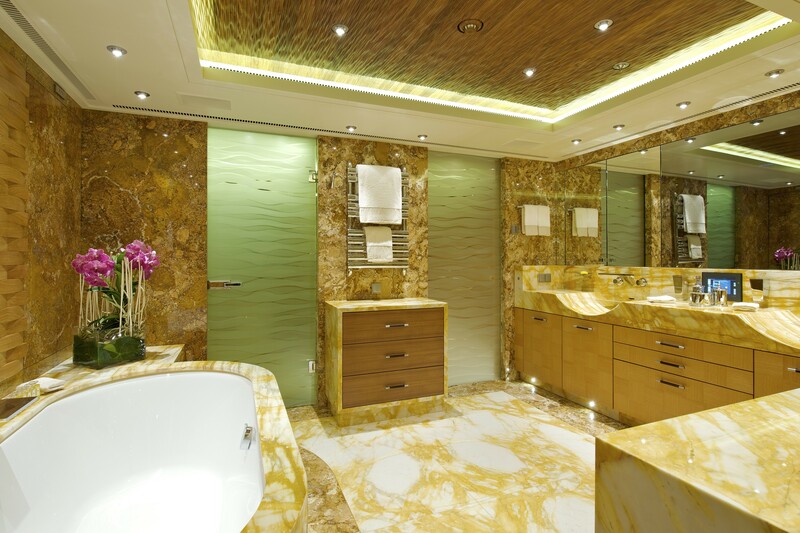 All of them are with en-suite bathrooms. 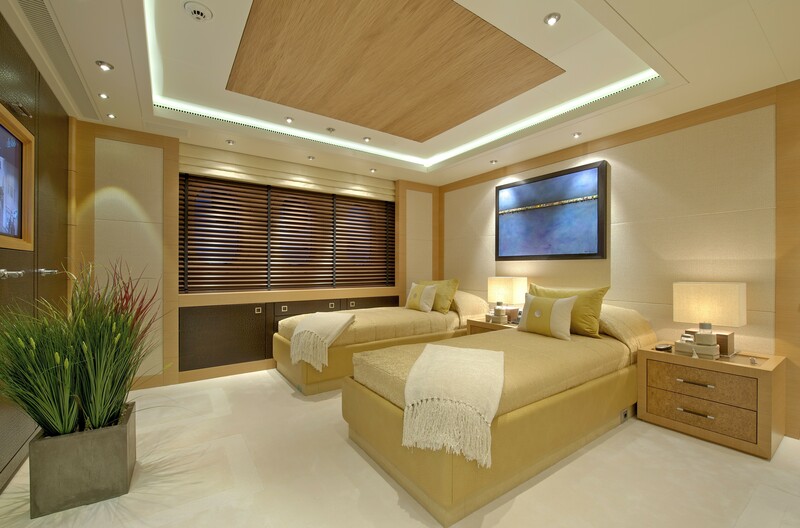 CAIPIRINHA provides accommodation for twelve, accommodating the guests in a full beam Owner's suite, VIP suite and four double guest suits; two doubles and two twins convertible into doubles. 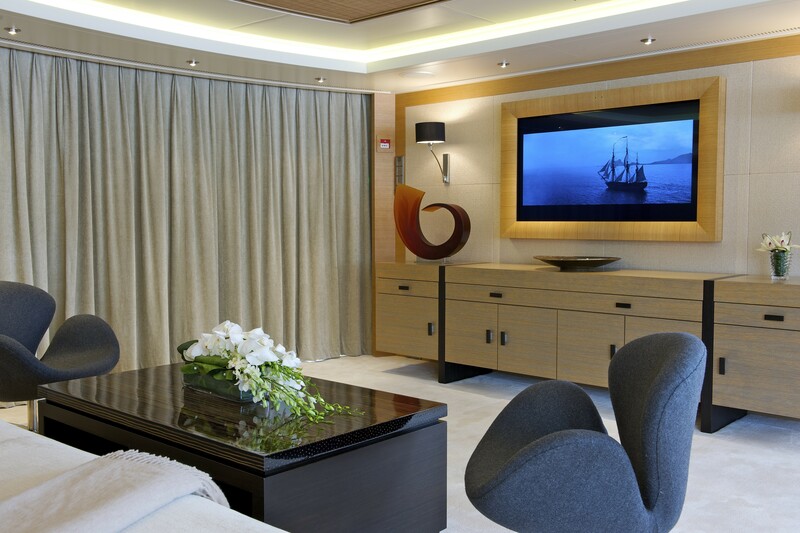 Each of the staterooms have their own Blue Ray/DVD/CD player, iPod dock and HD TV input connection. 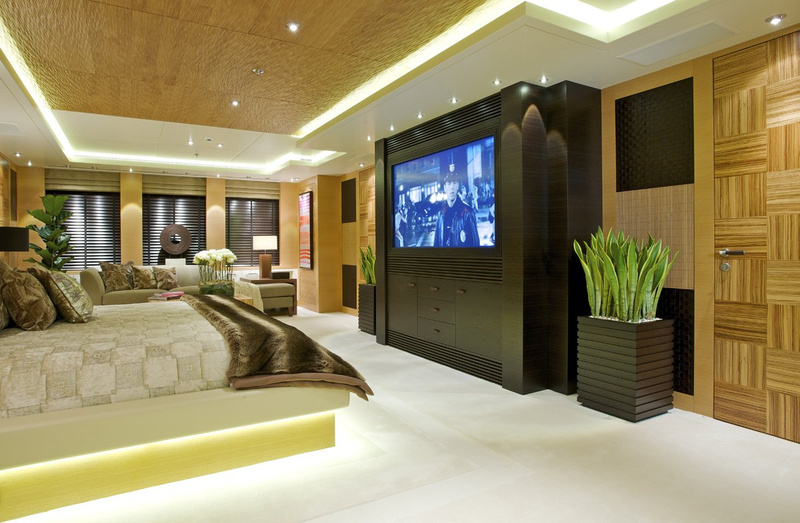 Each TV has direct access to a variety of Russian and Sky channels. 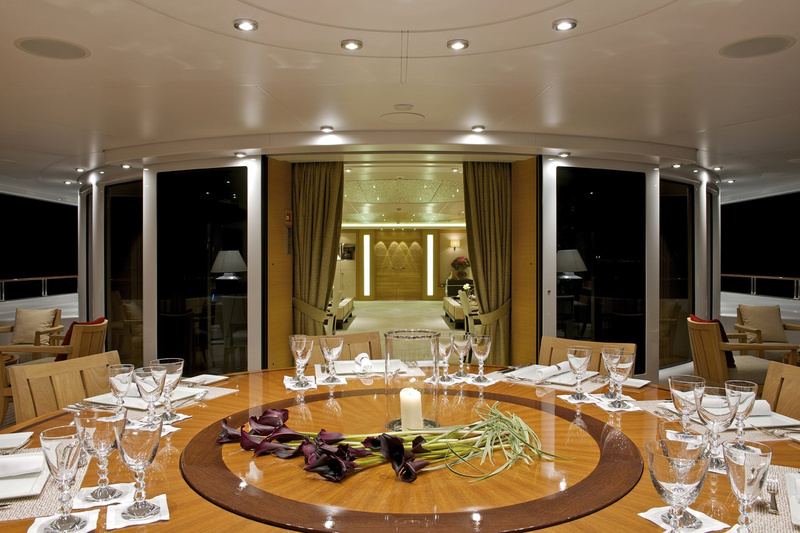 CAIPIRINHA is the ultimate luxury yacht charter having a range of amenities and equipment on board. 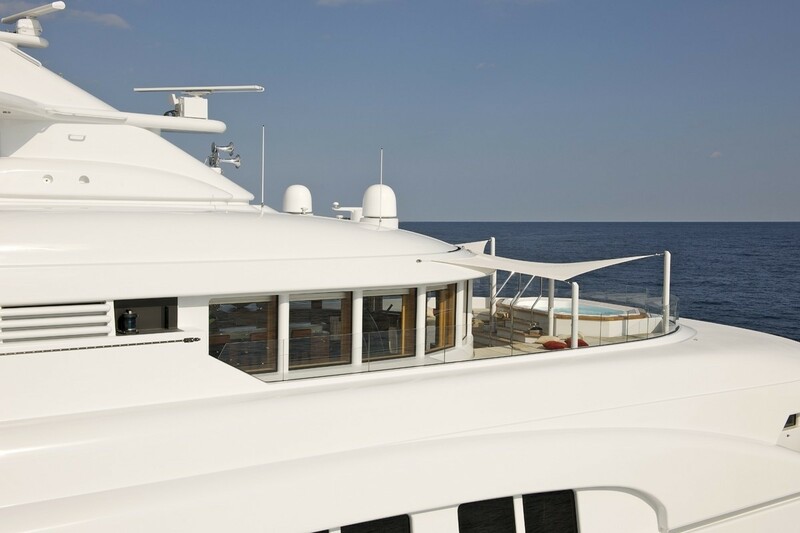 The yacht features a huge selection of diving equipment and water toys, including two luxury 7.5 metre tenders, two high performance jet skis, two SeaBob water scooters and a Laser Sailing Boat. 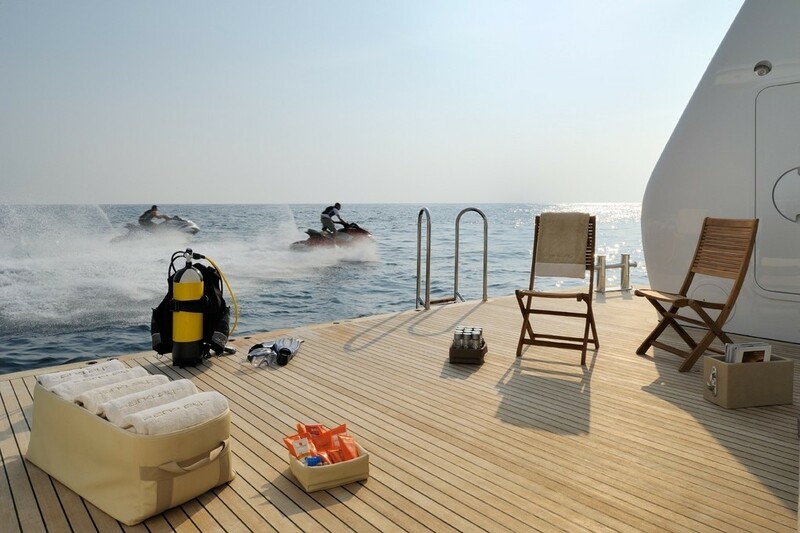 Two diving instructors are a part of Arkley's PADI certified diving school on board. 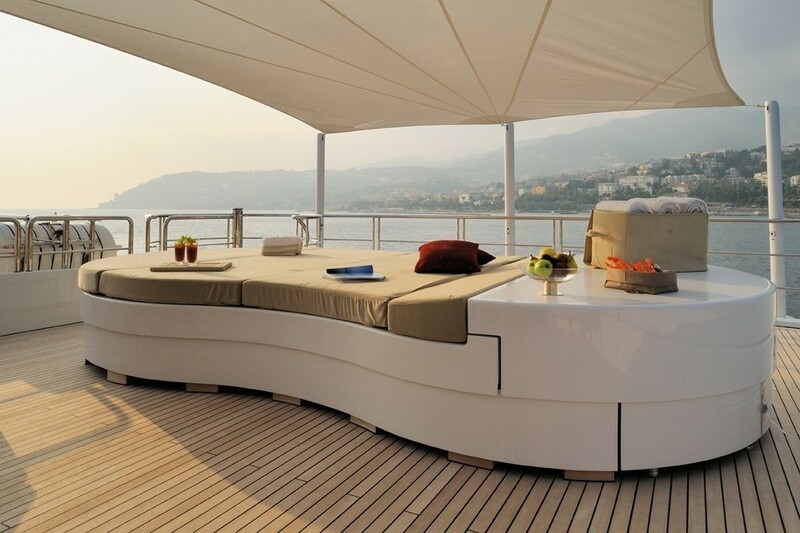 The sun-bed converts into a stage and there is a professional karaoke equipment. 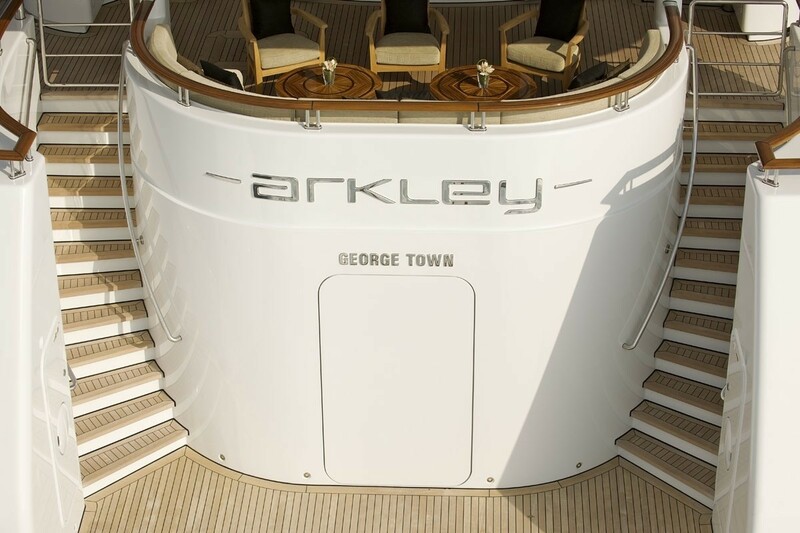 Arkley also prides herself with a dedicated and very talented chef, who will provide you with exceptional dining experience thought your voyage.